Blog > Protect Your Drive Repair Investment! Protect Your Drive Repair Investment! REAL LIFE SOLUTIONS IN THE PLANT: Practice safe drive repairs! If you spent part of your already tight budget on drive repairs, or even for an expensive NEW drive, protect your investment! You can do this by troubleshooting your equipment that the drive came out of. When troubleshooting, look for problems that may have caused the damage in the first place. This situation is not rare and is frequently the cause of repeat problems. And the cause of repeat repair expenses! The pictured Infranor drive repair p/n SMT-BD1/1A-220/12-W-T-BS has damage in the brake circuit including a blown FET and some damaged traces. What CAUSED this damage? The primary damage to this drive appears to have been caused by an external issue possibly with the brake resistor in the rack that this drive (and a matching one with the same damage) go into. The rack and external brake circuits need to be checked for problems BEFORE REINSTALLING these drives. 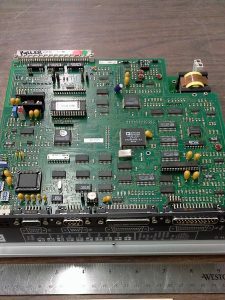 The ACS repair services included replacing FET, repairing trace damage, replacing high voltage capacitors, installing a new ipm output module as well as a thorough cleaning and testing. About the Author: ACS Industrial Services is an independent, third party industrial electronic repair center providing repair services for drives of all types and most all manufacturers including servo drive repairs, AC/DC drives, VFD drives, servo motors, encoders, printed circuit board repairs, monitors and touchscreens, PLCs, test equipment, light curtains, and much more. Our customer service team is available to answer your questions and help solve your industrial electronic repair concerns. Legacy equipment can be repaired! RUSH Service is available. You can reach them by calling 800-605-6419.